Last night in Atlanta, Georgia, ABV Gallery played host to a very special pop-up shop party for artist Greg Mike. 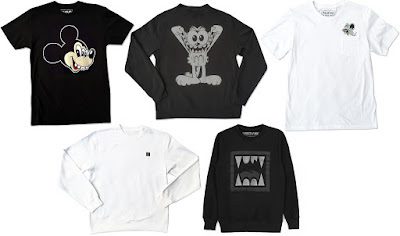 Along with selling a number of archived APs of long sold out prints, Greg Mike also launched a brand new clothing capsule collection featuring his signature logo G.FANG and his unique take on pop culture icons such as Mickey Mouse, Garfield and Tom (of Tom and Jerry). All of the t-shirts and crewneck sweatshirts seen here are currently available for purchase at Mike’s online store in sizes M-XL.